July 2, 2017 – Lionfish, one of the most destructive invasive fish species ever to reach the Caribbean, are wreaking irreparable damage on coral reefs by eating practically everything they come across. And they eat a lot: A lionfish’s stomach can expand up to 30 times its normal size. It has become of particular concern to environmentalists who lament the fact that lionfish, with no natural predators in the Caribbean, continue to grow at an alarming rate, with scientists fearing the invasive species may never be entirely eradicated from the region’s seas. Karolin Troubetzkoy, executive director of the storied Jade Mountain and its sister resort Anse Chastanet, together with her culinary team, have launched a “conservation cuisine” initiative preparing the lionfish as a delicacy. 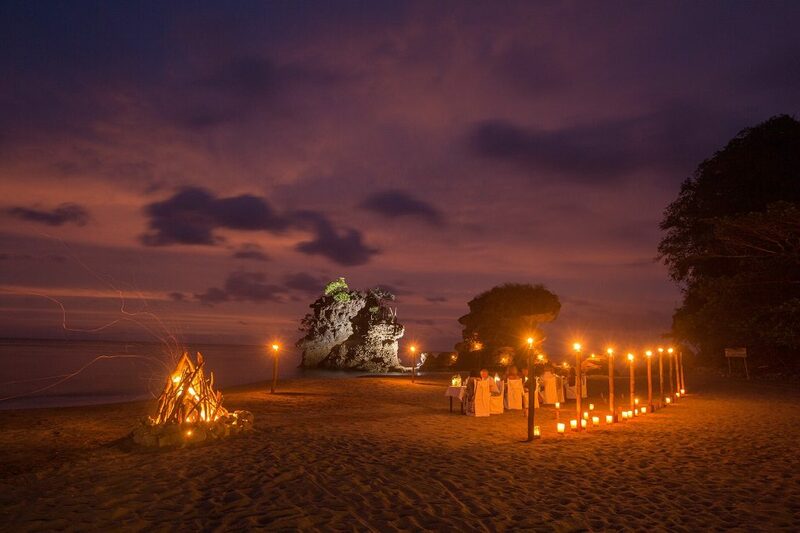 A perfect dinner setting to savor a lionfish meal at two of St. Lucia’s leading resorts. Diners, seated at a romantic beachside candlelit restaurant, are served lionfish as pure sashimi, citrus ceviche wrapped in a crispy tortilla, and either grilled or stewed with the flavors of St. Lucia. “It is always delicious and a very special dinner experience prepared by our best passionate chefs and sommeliers,” she said. And for the diving enthusiasts, the resorts’ scuba operation Scuba St. Lucia has introduced PADI’s “Invasive Lionfish Tracker Specialty Course”, which takes guests on two dives to learn about controlling the invasive lionfish population and discover practical methods for humanely capturing and euthanizing these fish. Lionfish reach adult size at about two years old, and it’s safe to say they won’t get anywhere near the endangered species list because a female lionfish can release between 10,000 and 30,000 unfertilized eggs every four days, or about two million eggs per year. “So, bon appétit and save our seas!” Troubetzkoy quipped. Anse Chastanet is set amid a lush 600-acre estate with two soft-sand beaches and breathtaking views of St. Lucia’s iconic twin Pitons mountains, a UNESCO World Heritage Site. Amidst St. Lucia’s lush tropical beauty, activities range from jungle biking, hiking and bird watching to snorkeling on the reef within swimming distance of the beach. The environmentally friendly, award-winning resort has 49 individually designed rooms, 37 of which are scattered about a lush hillside, and 12 that are nestled within a tropical garden at beach level. Innovative menus – one entirely vegetarian – are offered in four different locations and feature fresh produce served up from the resort’s organic farm. Guests can join interactive chocolate-making classes in the resort’s chocolate laboratory, or in a range of watersports.